Happy Friday! Welcome to Day 2 of the E-Team Blog Hop. 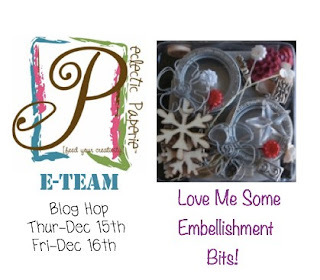 Joining in on the E-Team blog hop fun. I knew these new Maya Road Embellishment Bits Kit was going to be fun to play with. Lots of options and so many uses. Trying to keep things easy peasy in the midst of holiday chaos. Between kid stuff, school stuff, and work stuff, paper crafting is precious. I have to make the most of the time in between carpool. I am all about fast and quick crafts right now. 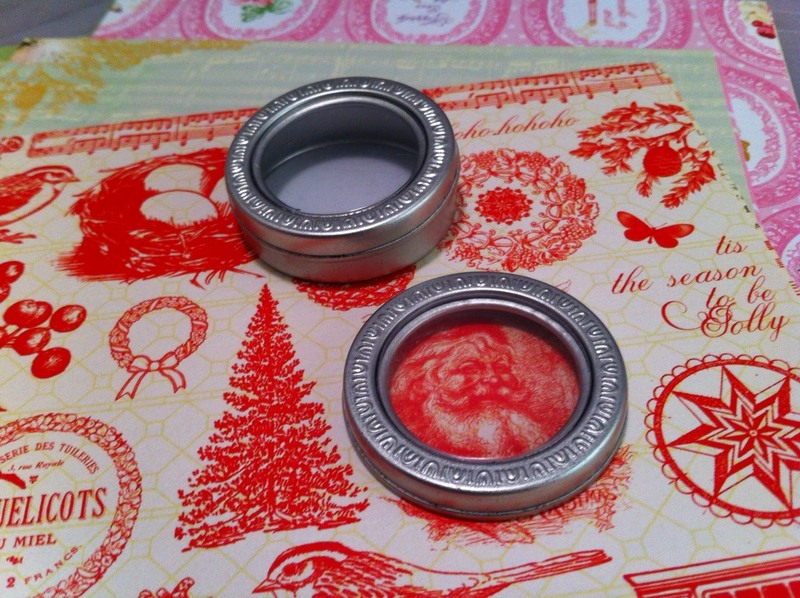 I eyeballed those cute Round Journey Tins in the kit. With some extra supplies and paper, I was ready to make these decorative and useful jumbo paperclips with the round tins as a shaker element. 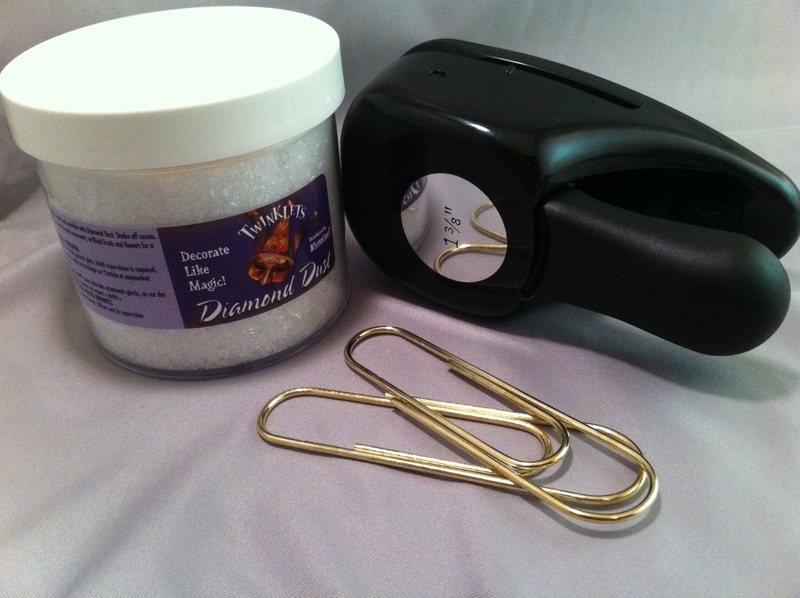 You can find this massive jar of Diamond Dust at your local craft store. Sometimes you may have to look in the floral section. The Diamond Dust will make sound, shake and not stick to your project. You can get the jumbo paper clips at your local office supplies store. The 1-3/8 circle punch was the perfect fit for the Maya Road small round Journey Tins. The Webster's Pages, Botanical Christmas & Winter Fairy Tales 6x6 paper pad had some perfect sized designs for my project. The 1-3/8 circle punch did the trick with its coordinating fit. The silver round journey tins were just a little off in terms of coordinating color with the jumbo paper clip. I took my alcohol ink pen to paint just a little color directly onto the tin. Next, to figure out how to seal the lids tightly, I used some Multi-Medium Matte and squirted a little around the inside rim lid. With some ribbon bits around the jumbo clip, everything was ready to be assembled. Use something like E-6000 to glue the paper clip to the back of the small Round Journey Tin. Drying time is required. I have found that with something like this project and the amount of times it is handled, E-6000 seems to be more secure than something like hot glue. 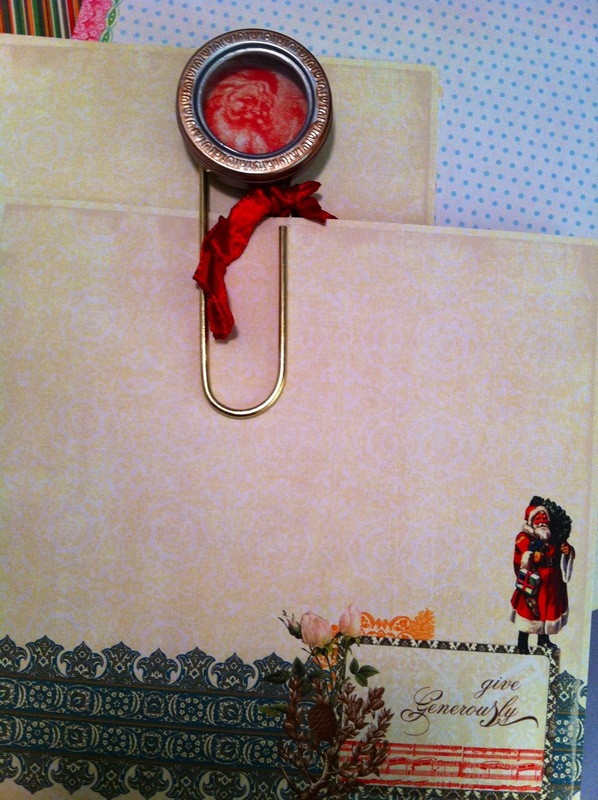 You can add a piece of felt, a flower, or a rosette to the other side of the jumbo clip for a more finished look. These jumbo paper clips with a decorated round shaker tin is a cute add-on to any gift tag, holiday recipe card, or note to someone special. We all need a little help keeping our holiday lists and coupons all together, too. It is Christmas time so eP is going to pick 6 winners for this blog hop. There will be a winner from each blog. 3 winners will win an fun box stuffed with eP embellishments that will include trims, brads, buttons, decorative pins, Stickles, & more. You can visit and leave the E-Team comments on their blogs beginning today through Sun, Dec 18th. Winner's will be announced on Tues Dec 20th on the eP blog. Have a great weekend! I hope it is filled with lots of holiday fun! What a cute and clever idea! Love it. adorable clips! such a great idea. Ooooh! I love how you put Santa in the tin with the snow! That's beautiful! 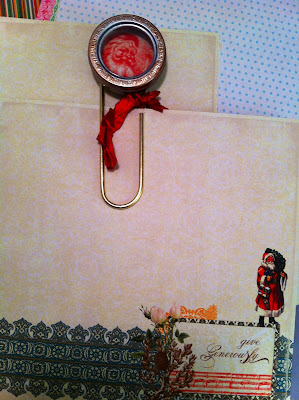 The shaker paper clips are a wonderful idea, and sweet gift too! Thanks for the hop!! Such a wonderful idea, just love it. Thank you so much for sharing it. OMG, Daisy! 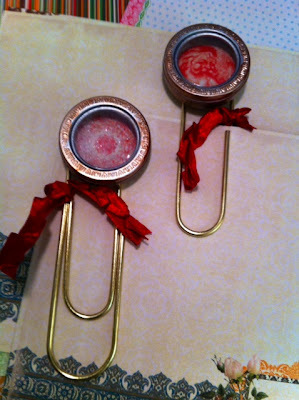 What a fantastic idea to make the tins into shakers and then into book marks with the paper clips. I'm definitely going to have to whip up some of these for stocking stuffers! What a unique and great idea for the little tin. I love this!! Such a super cute project!! Would make neat 'tags' for gift packaging too! Fun hop... thanks! Love these jumbo paper clips! Very unique and so many ways to attach them! Beautiful! These are so cool! Now to make a run to Staples! what a great idea to alter and decorate the clips! Fabulous & creative idea! Love it! Super cute idea, Daisy! I love jumbo paperclips...and the diamond dust makes it look so magical! Great idea! I love the little tins! I have all of these-I'm going to give this a try. Oh, those little tins are just too darn cute! Wow...I love that shaker clip. Those circle punches make life so easy! And I need to get my hands on some of those alcohol ink pens. FABULOUS idea! Those are SO cute!! These clips are adorable! Love what you've made. Great idea. Love the clips. Thanks for your tutorial on how to make the little shaker tins. Cool combination for Clips! Gonna try something similar myself...ty ty ty! i LOVE these - what a cute idea...and i have all the ingredients except the tin...better order some right now! Very cute paper clip idea! This would be wonderful to include with a made Christmas card list booklet. This is so very clever! Thanks for sharing! Ms. Daisy , first love your choice of embellishments for the E-Team ! Very creative santa shaker clips! wonderful hop with so many projects to love! thank you for sharing. I love this idea! Looks like a lot of fun to make! Great gift idea. I love that idea! Very cute paper clips! That is darling. I'm looking for Diamond Dust the next time I'm in the craft store. Thank you so much for your cool, clever ideas.